Which Bank will I get the Form from? What Registration Number will I use at the Bank? Can I pay the tuition fee in instalments? When is the Examination going to take place? What Subjects will I take During the Entrance Examination? When will my Payment be Confirmed? I have Completed Filling the Form but it's still showing "Incomplete Registration"
Can I change my Passport Photograph? I made a mistake on my Name. Can I edit it? Is there accommodation for JUPEB Students? Do I need to sit for UTME? What score must I have in the final Exam to qualify for admission into the University? Can I apply for JUPEB with NABTEB results? The Participating Banks are: First Bank, Skye Bank and UBA. At the bank, request you want to pay for OAU JUPEB Programme, through the eTranzact network. Make sure you mention "eTranzact". You can also pay using your ATM card (Masters or Verve Card) when you log in into your account and click on "Click here to pay through Webpay". You don't need any registration number to pay for JUPEB application. If the bank keeps insisting on it, you may want to try another bank or simply give them this number (08108287293 or 08111088498) so they can speak to us directly. Yes, instalmental payment is allowed, but not more than 2 instalments. When is the Entrance Examination going to take place? Obafemi Awolowo University JUPEB Entrance Examination holds on April 18th, 2015 by 11 : 00 A.M. All applicants are required to print their Examination Slips. You will be tested according to your subject combination. If your combination is Mathematics/Geography/Economics (MGE), you will be examined in all three subjects. English language which is a general study is compulsory for all. Your payment should be confirmed immediately you supply the correct numbers on the eTranzact page. The e-Tranzact receipt number and the confirmation order number are the numbers you need to confirm your payment. Please check all the numbers and make sure they are typed in correctly. If you were sent the numbers via text message, please confirm from the sender that the numbers are correctly typed. Make sure you use the correct values where required. If you want to pay through your ATM card, the payment should be confirmed immediately. The Receipt number is about 14 digits long while the confirmation order number is about 22 digits long. Make sure you are not using "Receipt for" or "Teller No." instead of "Receipt No.". If you still have difficulties confirming your payment, please call any of these lines: 08111088498, 08108287293 or write to jupeb oaucdl.edu.ng, stating your name, Receipt No, entrance exam no (if you have it). You most probably did not upload your passport properly. That is the incomplete part of your registration. Once your passport is properly uploaded, it will show on your page on the screen. Complete your registration by uploading your passport. A scanned recent passport photogragh. Written detailed account of the error with all necessary information. You typed in your username and password correctly; the way you did during creation of the account. The Caps Lock on your keyboard is off. Go to your Inbox in your email address and open the mail we would have sent to you. Click on the link provided to confirm your request. Another mail will be sent into your e-mail account containing your username and your new temporal password. 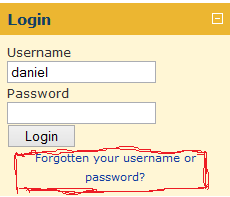 Now use the newly generated password to login into your account. Please, keep your new password secure. NB: These steps will only work if you supplied a correct and valid email address during your registration. Can I change some of my Information? You can update (change) the data on your form. To do this, simply login into your account, locate "Profile View" and click "Update your profile". Your form will be displayed and you will be able to edit it. Once you are done, click on update below the form. Please note that you cannot change your name, username, email address and passport. Please call our help line to speak with an officer (0811108 8498, 08108287293) if there is a need to modify any of that. OAU Centre for Distance Learning does not have its own hostel for JUPEB students for now but there are private hostels withing the community that are well secured and very habitable. Please scan your e-transact receipt and send it to us jupeb oaucdl.edu.ng so that we can verify your claims. Do include the username and the full name of the applicant and other relevant information in the mail. No, you do not need to sit for UTME but you will have to take JAMB Direct Entry Form to process your admission. You must have a Minimum of 3.5 grade to qualify for admission. NABTEB is not acceptable as O'Level results. You must have required result in SSCE or NECO.